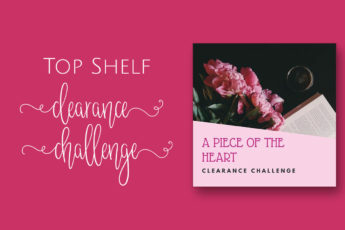 I was invited by some super creative, crafty and talented bloggers to participate in another Top Shelf Clearance Challenge! Links to all their blogs and their Clearance Challenge Projects are listed at the bottom of this post. Please check them out. The rules for the Top Shelf Clearance Challenge are as follows. Buy at least one clearance item for $15 or less. 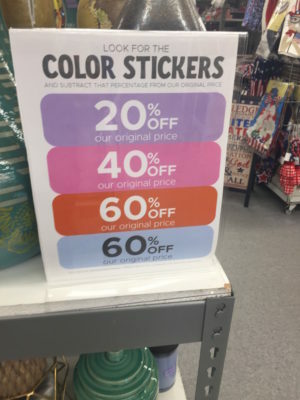 Take a photo of the clearance area and the clearance sticker(s). Then take the item(s) and style them or transform them as you wish. In case you missed the last Clearance Challenges, you can see them here. 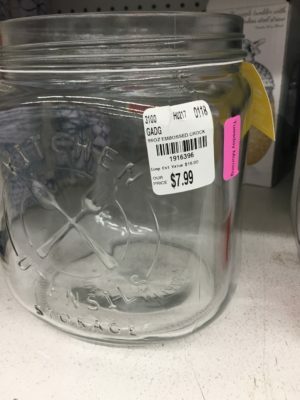 This time around I actually found TWO cute and useful things on the Clearance Shelves! Both of my projects were SOOOO easy too. That’s how I roll. I like things easy peasy. 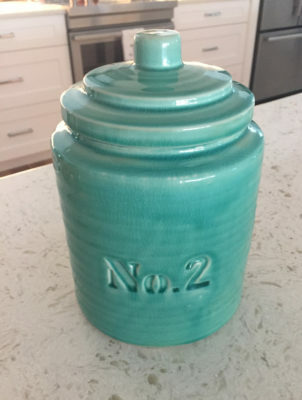 The front of this jar has the No. 2 on it. 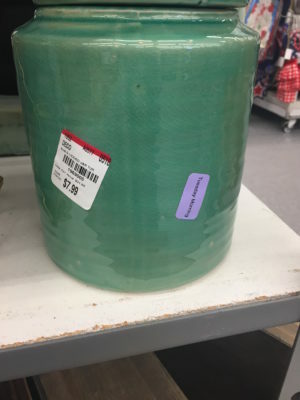 I suppose this was a part of a set of three jars, and they got separated and that is why this was on clearance??? I dunno? Not sure. Anyway, I recently bought a few new appliances for my kitchen in a mint green color. This toaster oven and this bread box. 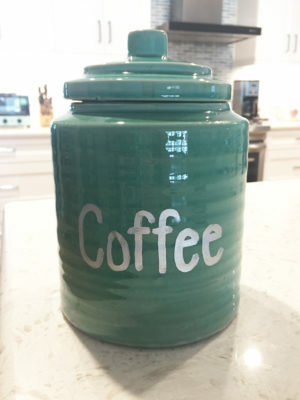 I thought this lidded jar would match nicely with them, so decided I would use it as a coffee canister to put next to the coffee maker. 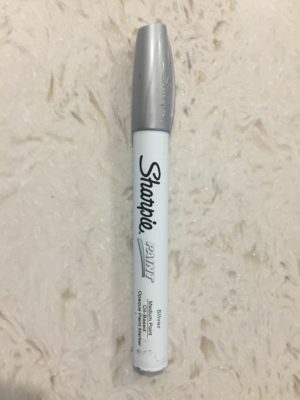 I grabbed this silver Sharpie paint pen from my desk and wrote the word ‘Coffee’ on back side of the jar. That’s it. I told it is was easy! I free handed this (slowly and carefully), but you could certainly use some stencils and paint to make sure they looked perfect. By the way, I was planning on using a white paint pen, but the silver was all we had on hand so I went for it. 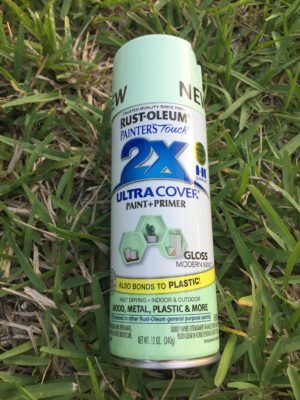 I bought a can of this Modern Mint spray paint and used two or three coats of the paint until I was happy with how it looked. Then, once it was completely dry, I put all my utensils in it and placed it on my counter. Viola! Very simple, very easy. And here is the how they both look in my kitchen. The Coffee Jar isn’t a perfect match, but looks good enough to me! I suppose I could have spray painted that too, but I love the color as is. And that’s it, 2 super simple projects for under $15.00! 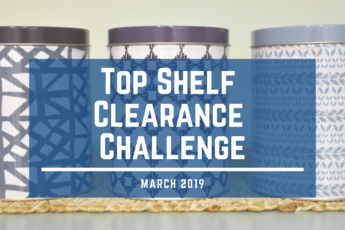 Please check out all the other bloggers and what they came up with on this month’s Top Shelf Clearance Challenge. 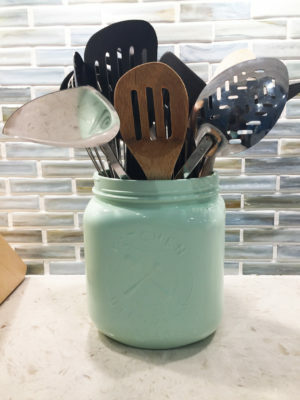 Jodi, I love the color of both of the jars and how creative you are to re-purpose this for your home! Thank you! A little paint goes a long way! So creative! Love the colors, too! This was such a fun challenge! Thank you! I always love these challenges too. Who doesn’t love a good bargain? I love what you have created!! 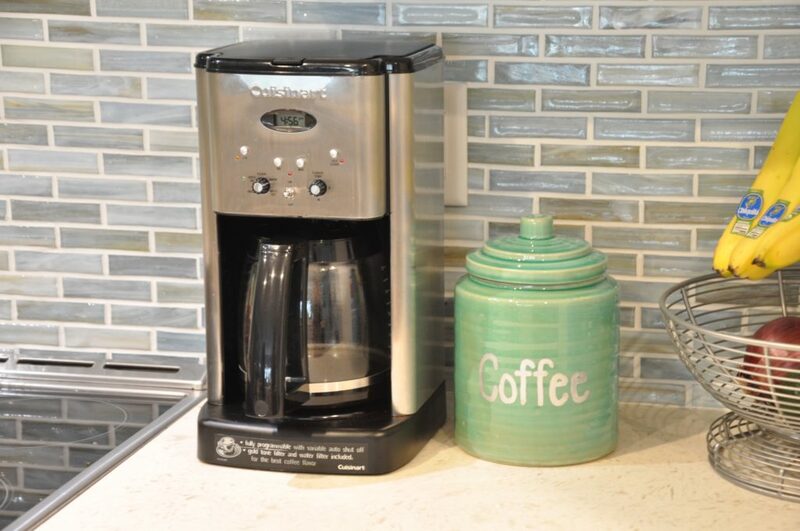 The coffee canister…genius!! And, you have AMAZING handwriting!! Looks so good!! Jodi…..now what a great find. They both look so nice in your kitchen. 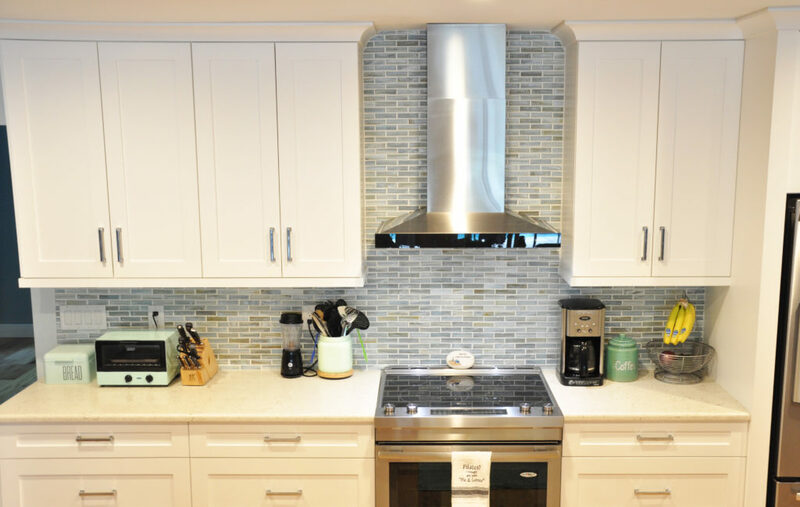 I do love the accent color you have in your kitchen. The coffee canister looks awesome and what neat handwriting you have. I would diffidently have to use a stencil to make mine look as neat as yours, but that wouldn’t be a problem. 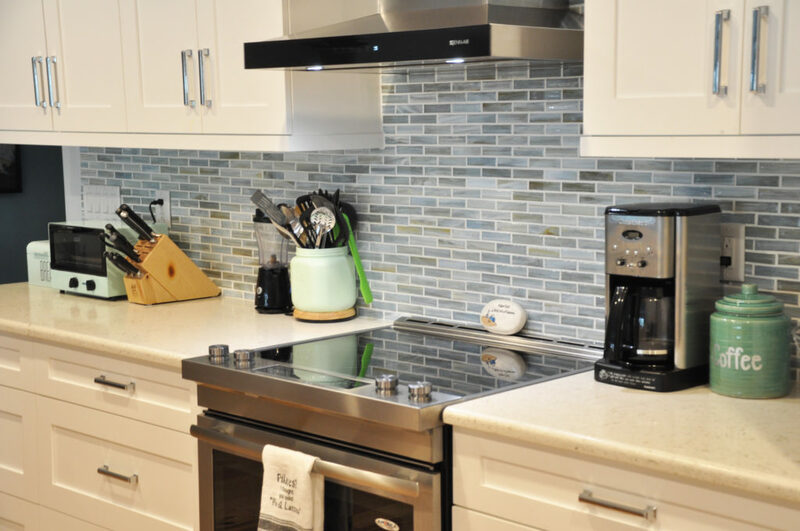 You created a great look for your kitchen under $15. I just love decorating on a budget. I enjoyed working with you on this challenge. Can’t wait until next time. Thank you Terrie! Your projects always amaze me. Great finds, Jodi! 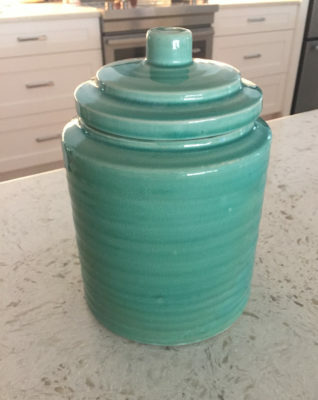 I think it’s great that you left the lidded jar the color that it was. I think it makes it more interesting to throw in a little bit of color variation, don’t you? Good job! Thank you. Yes, I agree, it definitely makes it more interesting.